I've always thought Kurt was highly overrated. Too bad I can't hang out for the next 200 years and see how he fits in the pantheon of American writers in the future. My expectation? "Kurt who?" Just what I needed... A little post-nihilist existentialism to brighten my day. I tend to agree with you, but if Vonnegut had written nothing but Harrison Bergeron, he justified his existence. I loved "Blackbeard", so I forgive his animosity towards mankind. 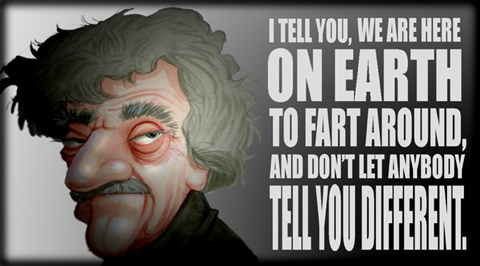 I like to be reminded occassionally that when I take myself to seriously, Vonnegut is there to say sometimes absurdity reigns. Do you mean Bluebeard? I had to read that in a college Lit class. That was a decent book. I think the bulk of Vonnegut's "work" wasn't particularly well-written. I would put it several steps below Dave Barry, but Kurt got a pass because he was a Lefty, & the literary types that dominated universities when I had to read him (I can only expect that they're worse now) were mightily impressed with the outlandish things he wrote--especially when they offended the sensibilities of Right-leaning folk... but such is the way of the hoity-toity realm of the "artsy" communities. The definition of some really good mp3 players for kids? My cousin is 5 years old and for christmas I need to buy her a iphone, she loves my nano but I think it might be difficult for her to utilize it. Are there any good ones for kids? I just wanted to write a small comment in order to say thanks to you for all the great guides you are sharing on this site. My extended internet investigation has at the end of the day been compensated with good information to exchange with my family. I 'd admit that many of us visitors are really blessed to exist in a fabulous website with so many awesome individuals with helpful secrets. I feel truly blessed to have used the web site and look forward to plenty of more fabulous moments reading here. Thanks a lot once again for all the details. Thanks for all of the information. On a side notice, how do you cope with all of the spam you get on your weblog? My new weblog is getting destroyed by random spammers and I've been spending plenty of time and energy deleting feedback its simply not funny. . I get so drained preventing spam that I feed I should stop running a weblog entirely. Thanks for due to this spectacular post. i'm invariably near to the present up out for content material and was lucky to uncover you on yahoo i'm going to utterly be again nonetheless again againg to establish what different spectacular content material you post. I couldn't have really asked for a better blog. You're always at hand to present excellent assistance, going directly to the point for quick understanding of your target audience. You're really a terrific specialist in this subject matter. Thanks a ton for currently being there guys like me. While this matter can be very tough for most people, my notion is that there has to be a middle or common ground that we all can find. I do treasure that you've added relevant and intelligent commentary here though. Very much thanks to you! I'm extremely impressed with your writing skills and also with the layout on your blog. Is this a paid theme or did you customize it yourself? Anyway keep up the excellent quality writing, it’s rare to see a nice blog like this one today.. Thanks for posting this article. I'm definitely frustrated with struggling to search out pertinent and intelligent commentary on this subject. Everybody now goes to the very far extremes to either drive home their viewpoint that either: everyone else in the planet is wrong, or two that everyone but them does not really understand the situation. Many thanks for your succinct, relevant insight. Have you ever thought about adding a little bit more than just your articles? I mean, what you say is important and all. However imagine if you added some great visuals or video clips to give your posts more, "pop"! Your content is excellent but with images and video clips, this site could definitely be one of the very best in its field. Amazing blog! This page contains a single entry from the blog posted on November 9, 2009 2:07 PM. The previous post in this blog was Opening Act.